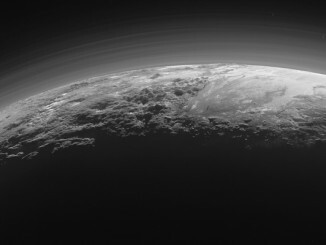 A new image from NASA’s New Horizons spacecraft is the first look at Pluto’s atmosphere in infrared wavelengths, and the first image of the atmosphere made with data from the New Horizons Ralph/Linear Etalon Imaging Spectral Array (LEISA) instrument. 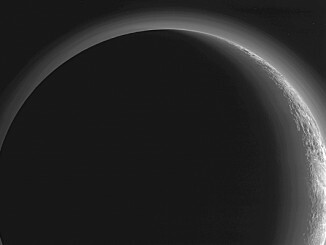 In the image, sunlight is coming from above and behind Pluto. The image was captured on 14 July 2015, while New Horizons was about 112,000 miles (180,000 kilometres) away. The image covers LEISA’s full spectral range (1.25 to 2.5 microns), which is divided into thirds, with the shortest third being put into the blue channel, middle third into the green channel, and longest into the red channel. North in this image is around the 10 o’clock position. 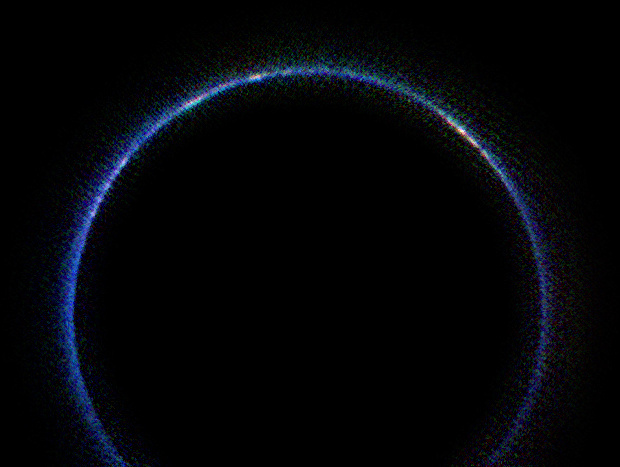 The blue ring around Pluto is caused by sunlight scattering from haze particles common in Pluto’s atmosphere; scientists believe the haze is a photochemical smog resulting from the action of sunlight on methane and other molecules, producing a complex mixture of hydrocarbons such as acetylene and ethylene. These hydrocarbons accumulate into small particles — a fraction of a micrometre in size — which scatter sunlight to make the blue haze. The new infrared image, when combined with earlier images made at shorter, visible wavelengths, gives scientists new clues into the size distribution of the particles. 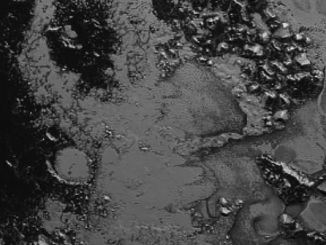 The whitish patches around Pluto’s limb in this image are sunlight bouncing off more reflective or smoother areas on Pluto’s surface — with the largest patch being the western section of the informally named Cthulhu Regio. Future LEISA observations returned to Earth should capture the remainder of the haze, missing from the lower section of the image. A newly discovered mountain range lies near the southwestern margin of Pluto’s Tombaugh Regio (Tombaugh Region), situated between bright, icy plains and dark, heavily-cratered terrain. This image was acquired by New Horizons’ Long Range Reconnaissance Imager (LORRI) on July 14, 2015 from a distance of 48,000 miles. A crescent Pluto stars in pictures captured just after NASA’s New Horizons spacecraft’s July flyby of the distant dwarf planet, exposing eerie backlit fog banks and glacial flows that scientists say hint at an Earth-like weather cycle.